The Crypt is a room inside the Haunted Towers in Luigi's Mansion: Dark Moon. The Crypt is a fairly small room. There are rows where coffins were being placed, but some coffins are missing, and some of the shelving is broken. Part of the Crypt is blocked by a brick wall that can easily be destroyed by yanking the root jutting from it. Behind this wall are two vases and a portrait of a Toad. During Graveyard Shift, Luigi must go to the Crypt to search for the special key to open the door inside the Hollow Tree. When he gets there, he instead finds a Toad trapped inside a portrait. Instead of searching for the key, Professor E. Gadd instructs Luigi to take the Toad to the Pixelator in the Gardener's Lab. 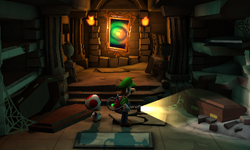 In this same mission, using the Dark-Light Device, Luigi can reveal that one of the vases are missing inside the Crypt. After capturing the Spirit Balls, this mission's Boo appears. This page was last edited on September 12, 2017, at 20:28.